You might remember my account in a previous post about our friends who follow a paleo diet. The word “diet” doesn’t really do it justice though, since this is no short-term eating plan for our friends, but more of a lifestyle. 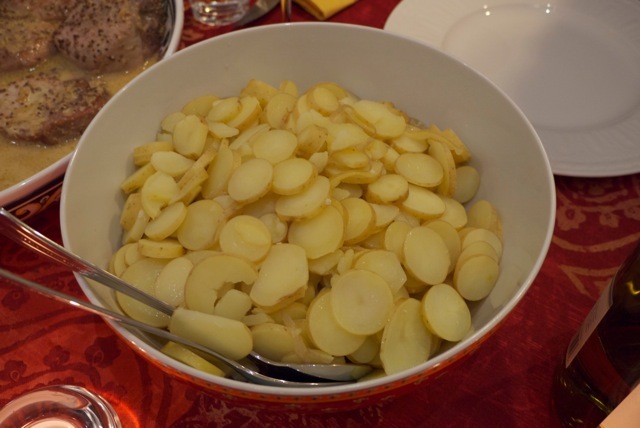 In short, the paleo philosophy is to eat as our hunter/gatherer ancestors would have- meat, vegetables, nuts, some fruit (in season), occasional honey, but no grains, legumes, sugar (really no processed food of any kind). If you want to read more about it, and our friend Richard’s 60-lb weight loss, check out his blog- http://freetheanimal.com/ . 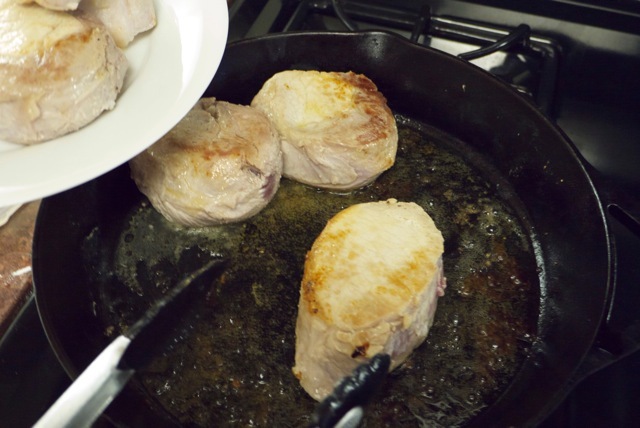 Whenever we have these friends over for dinner, they are quick to emphasize that “paleo is not a religion” and I don’t have to adhere to it when preparing the meal. 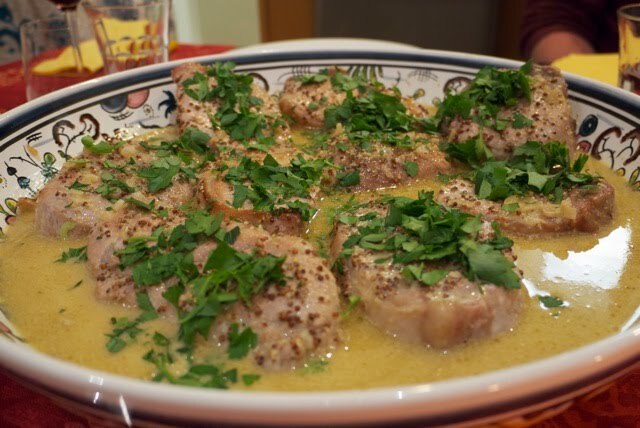 I appreciate their flexibility and may someday decide to make a not-completely-paleo meal, but so far it has been fun to menu-plan and think of creative ways to make a paleo meal. Honestly it really isn’t such a far cry from how we already eat, since a big part of the philosophy is essentially elimination of processed foods. The biggest challenge is usually dessert, since sugar and flour are out. Last time, I made a raspberry tart with a crust made from coconut flour, almond meal, butter and dates. This time, the meal consisted of a mushroom souffle*, porc a la moutarde, fingerling potato “coins,” and a blackberry mousse for dessert. I wish I could say the meal was a compete success, but it definitely wasn’t my proudest moment in the kitchen. The mushroom souffle was tasty, but didn’t rise as much as I would have liked and the pork was extremely tough. 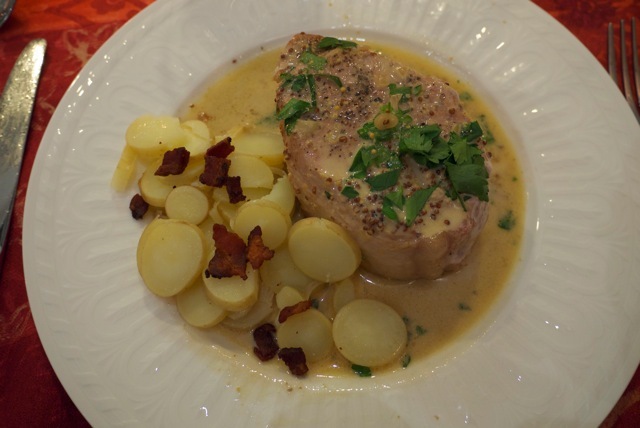 Luckily, the potatoes were tasty and the mustard sauce almost redeemed the tough pork. Needless to say, I hope to have a “redo” with these friends in the near future. The pictures turned out well, though, so I think I’ll post those anyway! And as for the berry mousse, that recipe is coming soon. Also coming soon is a post about the delicious paella meal my friend Anton and I made together for our “Spanish” evening. * I realize there are accents missing from some of the French words in this post. I tried to put them in but Blogger freaked out and told me I had html errors. Rather than spend hours pulling out my hair trying to fix this, I decided to omit them. This entry was posted in french, paleo on July 31, 2010 by seedsowingmama. I’m always a little apprehensive about venturing out to my patio garden after a long time away. We do have a drip system now (thanks to my wonderful, handy husband!) so the odds of my plants shriveling away have significantly decreased. But you never know when a hoard of aphids will attack poor unsuspecting tomato plants! When we got home Sunday night I took a quick peak outside and everything looked okay…better than okay, in fact. We had a bunch of new cherry tomatoes popping up and a new little eggplant! 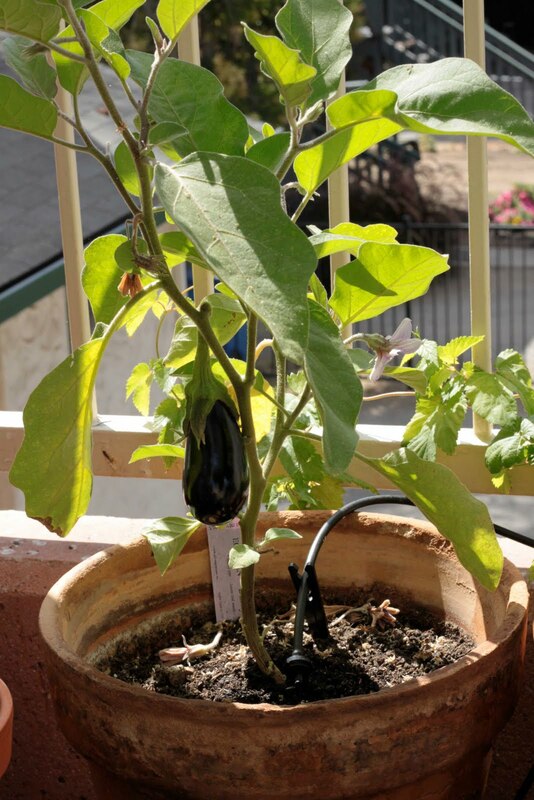 The eggplant…plant?…also has a bunch of flowers on it, so hopefully there’ll be more eggplants to come. I see eggplant parmigiana in my future! 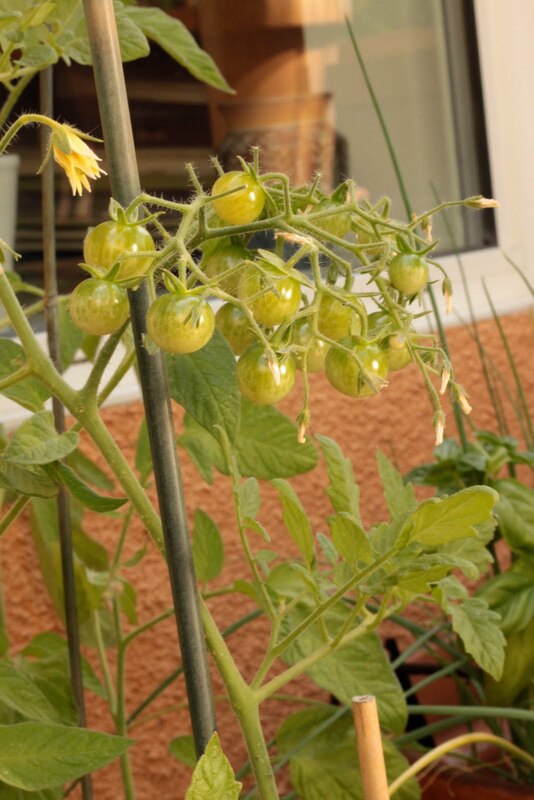 This entry was posted in seasonal, sustainable, tomatoes on July 20, 2010 by seedsowingmama. Once again, I have been neglecting fraises et tartines for far too long. Now that the school year is over and we’re home from our various trips, I have no more excuses and so, here I am. Not that blogging has somehow become a chore, it just hasn’t been a priority for, oh, the last 6 months (I suppose that much is clear). What I didn’t realize prior to the vacation we returned from last night was how many people around the country (both known and unknown to me!) follow my blog. Over the last 3 weeks, we have been to 7 states (some just driving through) and seen friends and family along the way. I was a bit shocked but mostly humbled that at each stop along the way there was someone giving me a finger wagging and an “evil eye” for neglecting my blog for so long. I even got some, “My friend follows your blog and says you haven’t updated in months!” Wow! Hopefully this will give me the kick in the pants I needed. 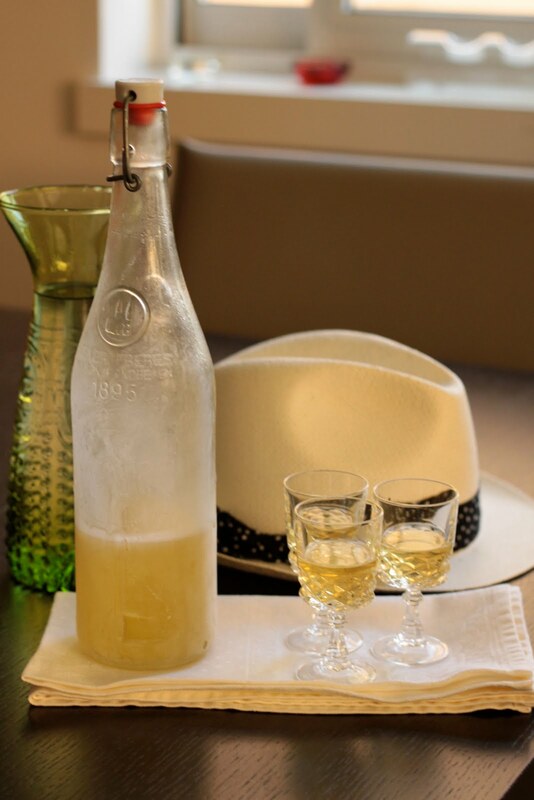 I thought that given my long absence, a guide to making limoncello would be an appropriate first post back, since this recipe is largely a test in patience. It takes about two and a half months to make, but the result is completely worth the wait. Strong, flavorful, smooth and refreshing, limoncello makes a superb after dinner drink. To start, you’ll need a large, 1.5 L, mason jar, 10 lemons, a 750 ml bottle of Everclear (get the strongest your state will sell you…here in CA that’s 150 proof, but in New Jersey we found 180 proof, whew! ), and a very sharp paring knife. Start by carefully peeling all the lemons. Make sure you don’t have any white pith on the back of your lemon zest. This will make your limoncello bitter, and well, after two and a half months of waiting, that would be…bitterly disappointing. If you have pith on your zest, turn it over and shave it off with your knife. This is a labor of love, but it will be worth it. 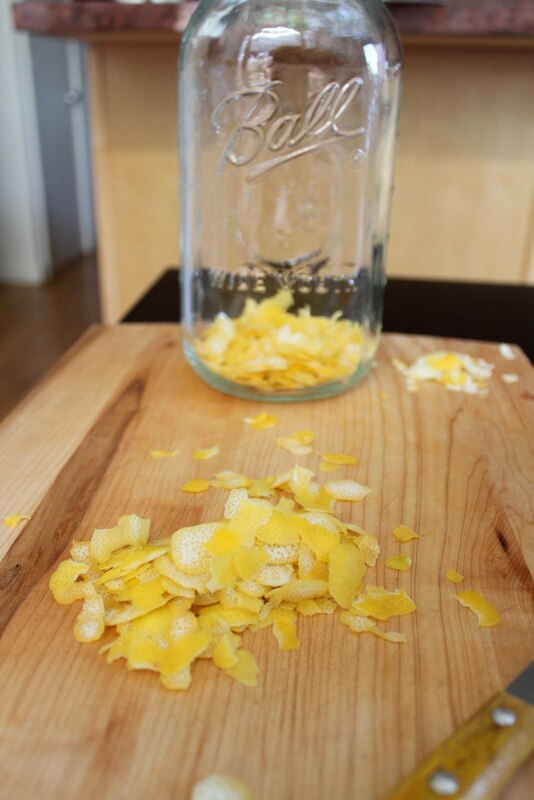 Once all of your lemons are peeled, put the zest in your mason jar, pour in the Everclear, and close it up. Now here’s the hardest part….wait 2 months. I know it’s long, but again, it’ll be worth it! I usually use masking tape to label my jar with the date the limoncello is ready for step 2. 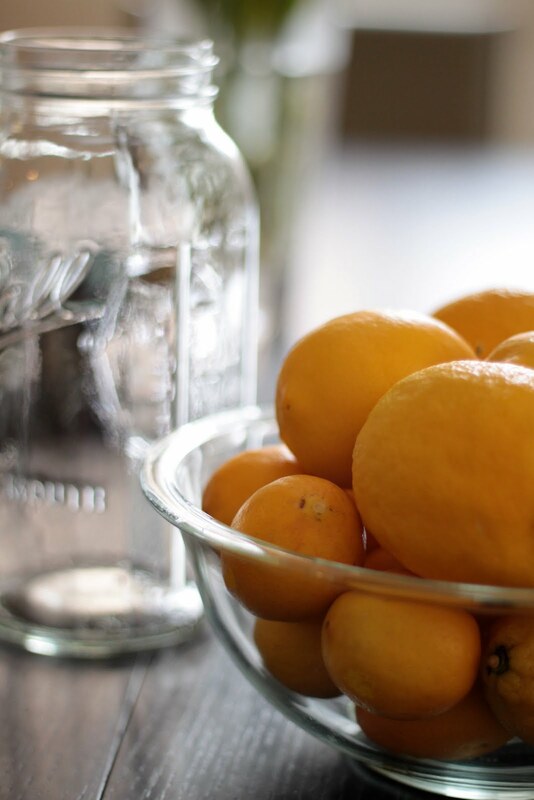 2 months later…take your mason jar out of hiding and prepare a simple syrup. I usually use a 1:1 ratio of water and sugar but some people like it sweeter and prefer to use more sugar. This is really up to you and your taste so experiment! You’ll want about 4 cups total of simple syrup so if you’re using a 1:1 ratio, combine 2 cups of water and 2 cups of sugar in a saucepan and heat slowly until the sugar is completely dissolved. Some say that if you stir the simple syrup as it’s dissolving you’ll end up with a cloudy limoncello, but I’m not convinced. I’ll need to experiment further with a side-by-side comparison and report back. Once your simple syrup is ready wait for it to cool completely to room temperature (another test in patience…good thing I gave you a ton of practice with 6 months between blog posts!). Once completely cooled, add the simple syrup to the steeping alcohol, leaving the lemon zest inside. Now you’re in the home stretch but you’ll need to dip into your patience reserves just a little bit longer. Wait 2 more weeks. 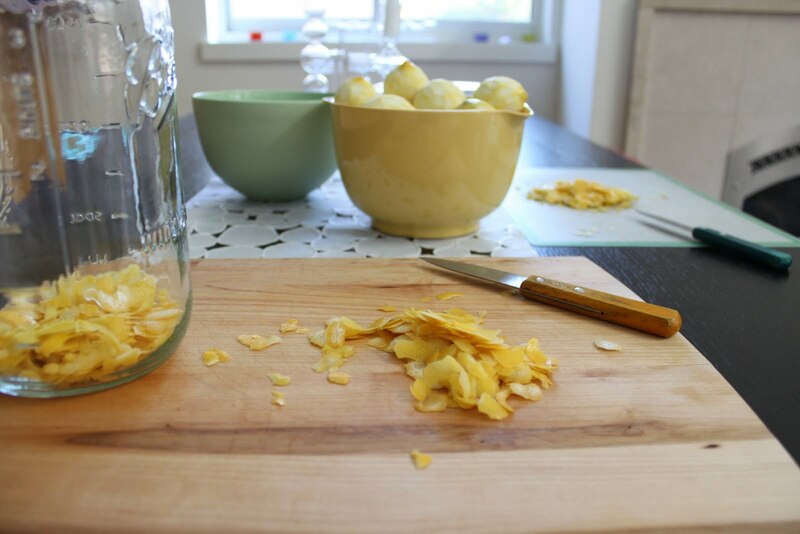 Then strain out the lemon peel and bottle your limoncello. I like to use bottles from French Limonade, which you can buy at Cost Plus, Whole Foods, and BevMo, because they have the EZ tops. 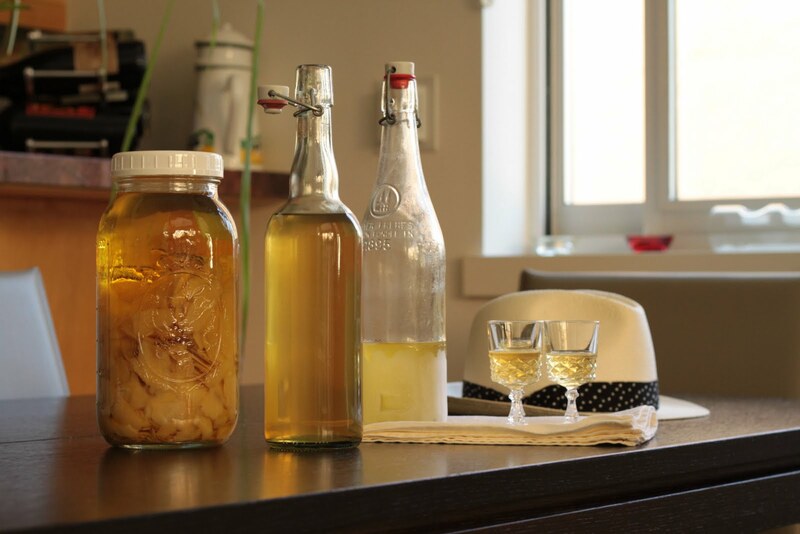 Drink the Limonade, wash the bottle and then use it for bottling limoncello. Once bottled, store the limoncello either in a dark closet or in your freezer. I prefer the limoncello cold, but without ice, so the freezer is perfect. With the high alcohol content, it wont freeze so you don’t have to worry about putting a glass bottle in the freezer. Enjoy the fruits of your patience in the smallest glasses you have. 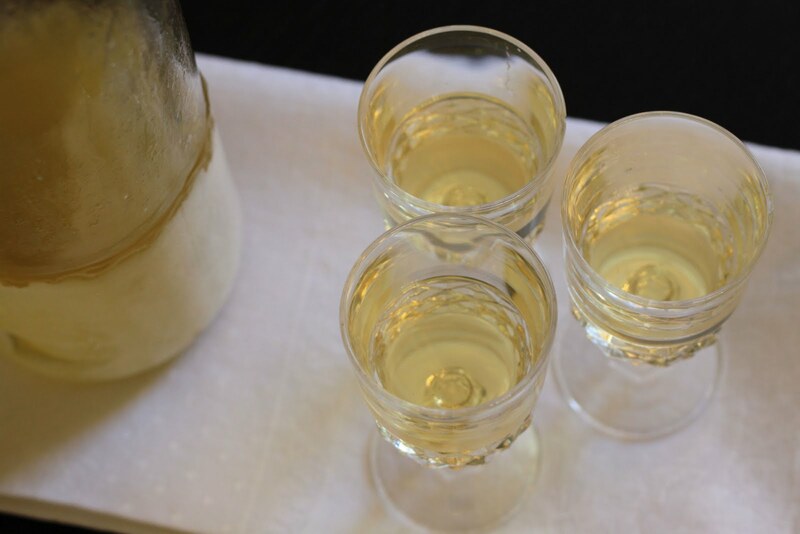 Limoncello is very strong and is best enjoyed in small sips. Cheers! Or rather, Salute! This entry was posted in beverages, italian, seasonal on July 19, 2010 by seedsowingmama.